With two young children it never fails that we are in need of batteries. There aren't many toys or games these days that don't require batteries. Summer travel season is in full swing and the ever changing cost of gas prices is impacting everyone. To help with the big summer shuffle between activities for your kids and family road trips, Energizer has a deal to help make a positive impact on your gas budget. They are rewarding Energizer® Lithium customers by helping their dollars last longer. 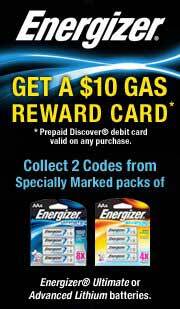 Consumers simply purchase two packs of specially-marked Energizer® Ultimate Lithium or Energizer® Advanced Lithium batteries and you will get a $10 Prepaid Discover® Gas Rewards* card mailed to you. Should you be interested in something other than purchasing gas with your reward card, the Reward Card may be redeemed for any merchandise offered by a retailer that accepts Discover. ONE lucky Being Frugal and Making it Work reader is going to receive Two (2) packs of batteries marked with special codes to redeem a $10 Discover Gift Card. Winner can also select between AA and AAA batteries. Tell me what item(s) you use that is always in need of new batteries. **I received one or more of the products mentioned above for free. Above information was provided to me by Energizer. Regardless, I only recommend products or services I use personally and believe will be good for my readers. The views and opinions expressed on this blog are purely my own. Results may vary. I was not compensated in any other way for this review. The generous sponsor of this giveaway will mail the prize directly to the winner. A special thanks to Energizer for this great giveaway opportunity! all them noisy baby toys that are a must have! We always need batteries for our cameras. 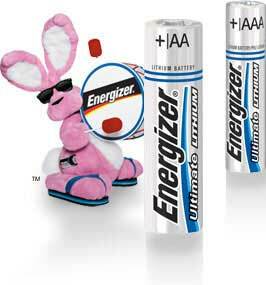 I like Energizer on Facebook - Sue Vanden Berge. I follow Energizer on Twitter - svberges. I follow Being Frugal and Making it Work on Networked Blogs as Sue Vanden Berge (2). I would like to try these in my sons XBOX 360 wireless controller to see how much longer they last vs. the regular batteries! Thanks for anoither great giveaway! We can use the gas card with the prices of gas these days! I use them in toys. I am an email subscriber . #1. TV remote. Ugh. My husband is in the living room right now beating the remote against the entertainment center to get it to work. Lol.